Geography students from The Sixth Form College, Solihull have just returned from a week in southern France, where they completed fieldwork as part of their A level course. 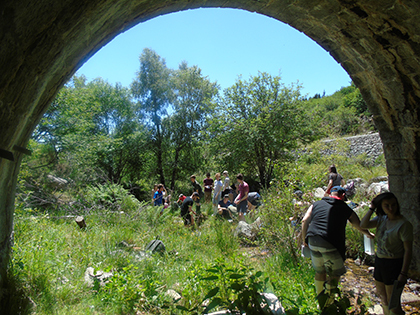 A group of twenty-five, first year A level Geography students visited the Cévennes National Park (Massif Central) to conduct their fieldwork studies. The data they collected will be put to use when they complete their 4000 word coursework report, worth 20% of their final A level grade. During the visit, the students were able to investigate the physical geography of the River Soutayran and the vegetation and weather conditions on the 1699 metre summit of Mont Lozere. Human geography fieldwork also included urban studies of Le Pont de Montvert and rebranding of settlements. As well as completing fieldwork, students were encouraged to take photographs for a nationwide competition being run by the Geographical Association. The Physical Geography photography competition has a theme, the Landscape Story this year and students are being encouraged to enter using photos they took on this trip or from their own independent travels.